Although overcast and muggy, the weekend turned out well. 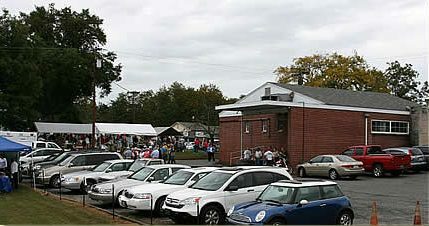 It began on Friday evening, Oct. 9, when over 100 smiling faces showed up at the Baptist Fellowship Hall for the 3rd Annual Society Gathering. It was an enjoyable and informative program. Ann Culbreth and Brenda Walters talked about their father, H. C. Beatty. Also, James Harris, presented a plaque for Eugene “Cheetah” Lipscomb to his sons, Martin and Robert. The tribute was for Eugene’s years of outstanding rock masonry in and around Cliffside. Read more about the Gathering here and here. The next day, the throng flocked up and down Old Main Street, inspecting the restored vehicles in the Old Car Show, eating, listening to musical groups, eating, paging through Ginny Ann Reid’s photo albums in the Masonic Lodge, gossiping, looking for old friends and eating. Our slide show includes photos taken Friday and Saturday by Marilyn Moore Kerr and Sherry Harris Phelps.